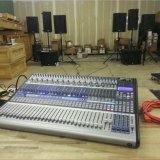 Can a StudioLive AI Series Mixer and an RM Series Mixer be run together or independently on the same software install of UC Surface? We do not support cascading of AI Series and RM Series Mixers so the mixers will show up as two independent mixers in the same UC AI device browser. However, the installer for RM series mixers which includes UC Surface also includes VSL AI software for AI series mixers. As of Universal Control version 1.5.0.23399, 1.5.0.29624 and 1.6.0.30286 and higher, these installs will overwrite your existing installation of Universal Control AI for your StudioLive AI Console, these systems will still be able to launch the VSL AI control panel for it as you normally would. Please Note: You must update your software installation to the latest release of Universal Control Ai 1.6.0.30286 to be on the most recent version that supports a co-installation of RM and Ai mixers. The VSL AI control panel that launches for the AI Consoles in the RM Mixer software release 1.5.0.29399 and 1.5.0.29624 is not supported. Use at your own risk, if we are contacted for support we will instruct you to update your software. However if you need to use an older supported release for your AI Mixer independent of the RM Mixer, you will need to uninstall Universal Control AI for your RM mixer and reinstall the supported release for AI mixers posted in your my.presonus.com account. If you experience any issues related to using your AI Console with the software release for the RM Series, please let us know in the "StudioLive AI Mixers" section of the PreSonus forum. We apologize for inconvenience this may cause, we are working on an update to resolve this issue. Why is it that FXB & FXD Don't Reappear When Switching from Higher Sample Rate to Lower Sample Rate? Can you record to Capture with the same Ethernet cable that runs the UC Surface software?